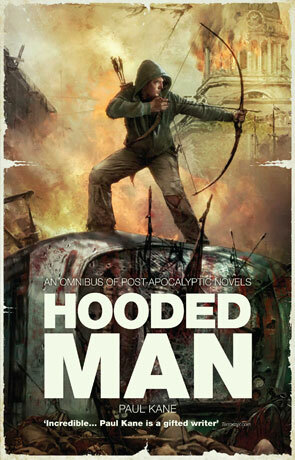 Hooded Man collects the three novels Arrowhead, Broken Arrow and Arrowland (along with a short story set between the first and second books), all of which are part of the shared post-apocalyptic universe known as the "Afterbright Chronicles" - which includes this years SF Book of the year School's Out Forever by Scott K Andrews. Every year in my local town (Lancaster) there is a play put on in one of the public parks (Williamson's Park) and by chance this years subject was Robin Hood. I've always loved this classic tale and we booked tickets to see it as soon as they became available last year. A week before I began reading "Hooded Man" my family and I watched the play which always makes excellent use of the natural features of the park and moves from location to location. Despite advertisements displaying classic Robin Hood garb, the writer had decided to go for a "modern" interpretation of the classic tale, set within a dystopian future. While this sounds like a great idea the writer also took far too many liberties with the plot and characters (none of which appeared to have ever read the original) and the result was a horrible miss-match which lost all the good points of the story and any meaningful message. It even mixed in some Shakespeare (which was actually the best bit) but none of it made any real sense. Why am I mentioning this? I really wish that whomever wrote the play had read Hooded Man first, he could have learned a lot about how it's supposed to be done. The characters in Hooded Man are aware of the Robin Hood story, they know that their lives have parallels to the classic tale - the protagonist is an ex-policeman who has excellent woodsman skills and teaches himself to use a bow (due in part to a lack of modern weapons to hand) while our antagonist of the first book set's himself up as Sheriff of one of the UK's best kept castle's - Nottingham. The author doesn't pretend to recreate the Robin Hood story, instead he draws inspiration from it to create his own unique story that makes effective use of the post-apocalyptic backdrop. While Kane clearly has a very different voice to Andrews both authors do justice to the rich shared universe in their own unique way. The Hooded Man himself cuts quite the enigmatic figure, a dark and brooding flawed hero who is driven to protect his charges and fights like a driven deamon. It's impossible not to like the guy, along with the supporting cast while the antagonists make equally good bad guys. The stories are entertaining, the pace is swift and steady and the three books join together seamlessly, each strong enough individually and yet together greater than the sum of their parts. Hooded Man is a rich post-apocalptic tale that adds much to the Afterblight Chronicles universe; a highly rewarding read. Written on 13th August 2013 by Ant.